New year, new me, new resolutions, new positivity ... really? Happy New Year! Do you break yourself in gently to the new year? Do you take time to recover from the previous year, wrap yourself up and slowly put your head above the parapet of the new year to see what might be out there? Or are you an all guns blazing, let's grab this year by the balls and start as we mean to go on type; resolutions, new projects already underway, clear action list, the previous year dusted off your shoulders like dandruff and a bright shiny face looking to all the possibility that awaits over the next 12 months? I am keen to be in the latter camp, but find myself firmly in the former. By mid-way through December I'm usually desperate for a new year, to feel energised and find a new productivity. I'm trying very hard, but the shocks of 2016 linger and as I can't and don't want to break the continual loop of 'Listen without Prejudice' on Spotify, it's proving a little hard to be all go for 2017. I haven't sewn a stitch in 2017 so far, but that's ok, I'm trying not to give myself a hard time but instead to enjoy the fruits of my pre-Christmas sewing extravaganza and slowly working up the energy to get sewing the things I planned in the autumn. I may also have fallen down a huge Gilmore Girls rabbit hole. All seven seasons in six weeks. In my defense there were a few days of flu-induced all day TV sessions in there but I still think it merits some kind of sad medal. Now I have overcome that addiction I can move on and embrace 2017. Anyway let's get to the sewing. This coat is my favourite item from the Pre-Christmas Sewing Bonanza. It's my take on a $1,200 Helmut Lang pale pink cashmere coat that I tried on in Saks a while ago; wryly smiling when the assistant asked if she should put it on hold for me; brain jumping straight to pattern and fabric options to recreate it. It took a while to hunt down some fabric but I eventually saw Lauren from Guthrie & Ghani's Clare Coat made in the perfect not quite blush, not quite pink, not brown wool melton and after an agonizing (because fabric of course induces such intense emotions) wait to see if they could source any more - they had sold out by the time I got round to checking out their site - I was the proud owner of two large remnants for a tenth of the cost of the Helmut Lang beauty. Not cheap but coats aren't and wool shouldn't be. As an aside, I am a huge fan of Elizabeth Suzann, and this post about how her clothes are priced and the pricing of clothing in general is 100% on point. 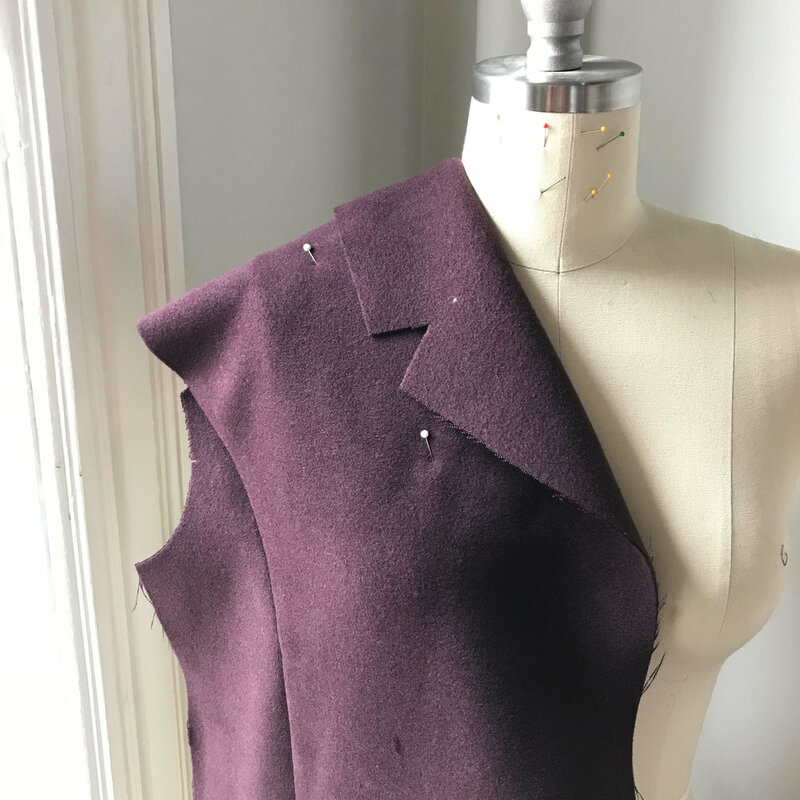 I used The Maker's Atelier Raw Edged Unlined Coat pattern as the base for Helmut, adding a total of 8 inches width across the back by slashing and spreading from shoulder seam to hem. I added an inch to the collar depth, 4 inches to the sleeve width at the cuff (I could definitely have added more - although as it is I keep getting the sleeves caught on door handles ... ) and then taking the five inches off the hem that I added to my previous iteration to balance out the volume. I also made larger pockets, using the pattern piece from my beloved Burda coatigan affairs and contrast topstitching finished it off. It was an easy make from a lovely and very adaptable pattern. I absolutely love the result and feel beyond stylish wearing it. Annoyingly, my timing as always is rubbish as clearly it is now far too cold in NYC to wear an unlined coat, but over Christmas in a milder England, it was perfect. I took to wearing a RTW scuba bomber jacket underneath it which definitely helps make it more wearable in the cold. I have plans to recreate the stunning petrol blue velvet bomber I saw on The Maker's Atelier Instagram feed to wear under it as well. The colour combination would make my heart so happy. This is about the fifth coat or jacket I've made in the last year or so. I have at least two more planned. I'm not really sure why. 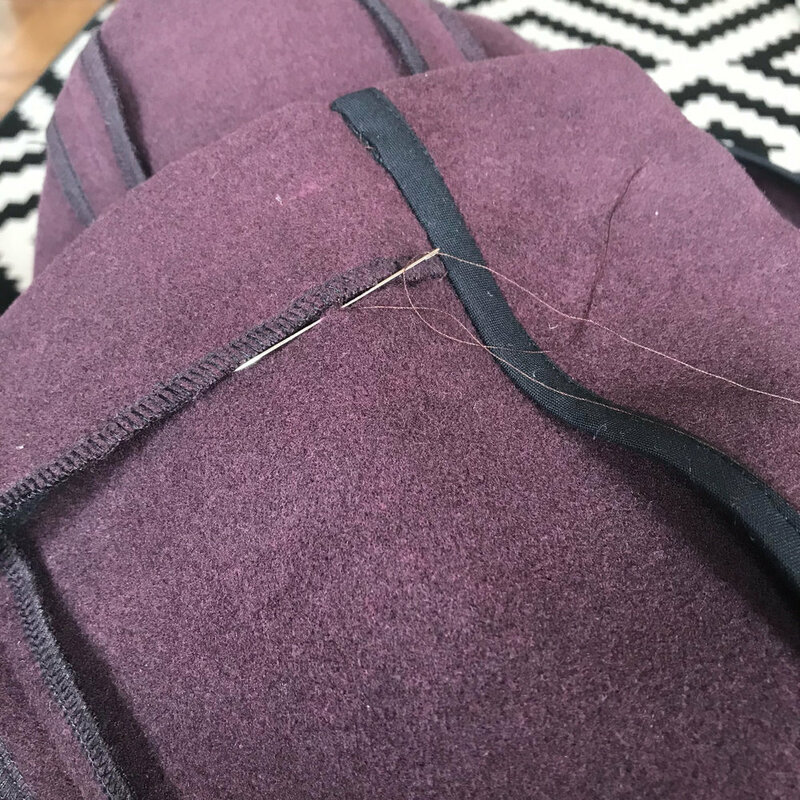 I have a ridiculous amount of coats, but there is something so satisfying about making them - not least I think due to the lack of detailed fitting involved and the sheer amount of wear they get. 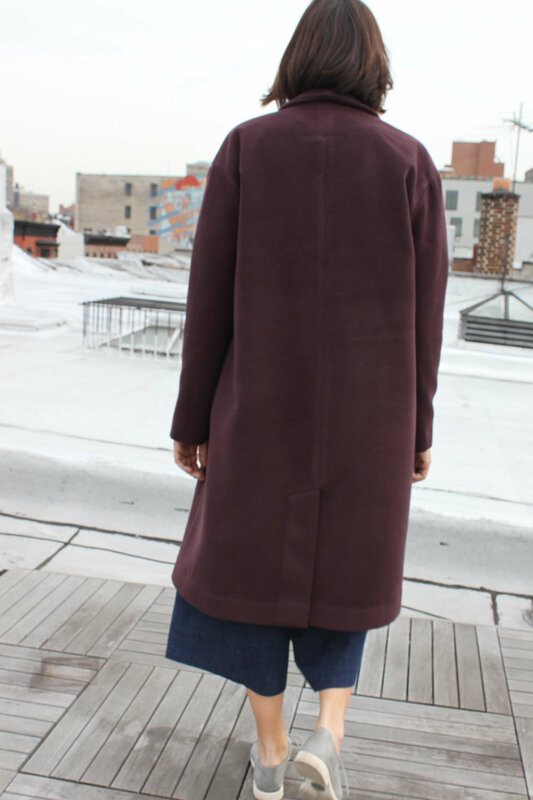 But the ultimate coat I want to make needs to be a beast as NYC for the next few months will be perishing. I have sub-standard circulation and get super cold which I hate, but I also hate the ubiquitous black quilted down jacket that I have taken to wearing. 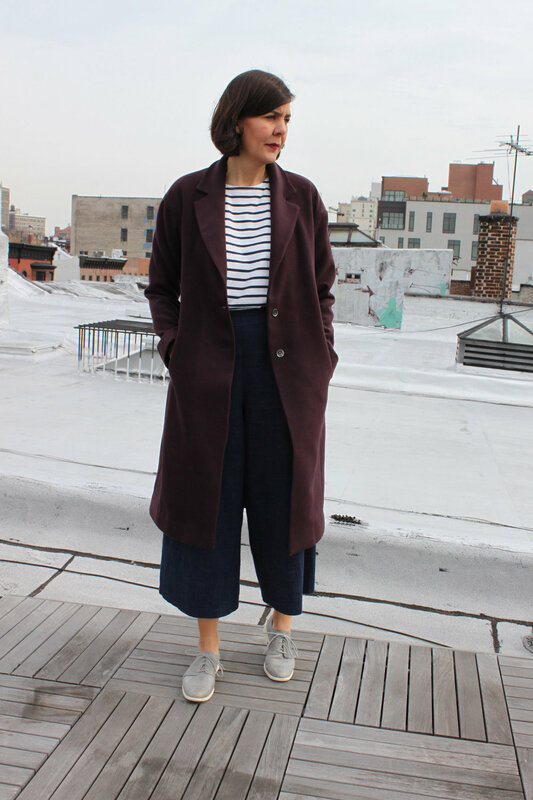 Why when it's this cold does style have to go out of the window? Is it possible to create a coat with the warmth and practicality of the dowdy down affair but with the style created by coats such as Helmut? I have a dream of a notched collared, furry woolen, dark blue teal, just-above-ankle length coat that is secretly underlined with down and lined with fake fur. Or something. In the meantime, I will be loving on Helmut at every above-freezing opportunity. I hope the start to 2017 has been good for you, more productive than mine and that the year brings much happiness. This jacket is vying for place as one of the most favourite things I have made. And if it wasn't for the fantastic sewing community it is unlikely that this would have happened. A lovely person, whose details I can not now find, left a comment on one of my Instagram posts suggesting I might like the patterns by The Makers Atelier. And man was she right. What an utterly lovely collection of patterns: Simple and clean, modern and classic all at the same time. In some respects similar to Merchant & Mills' patterns but less utilitarian - and I mean that in the nicest possible way to both organisations. 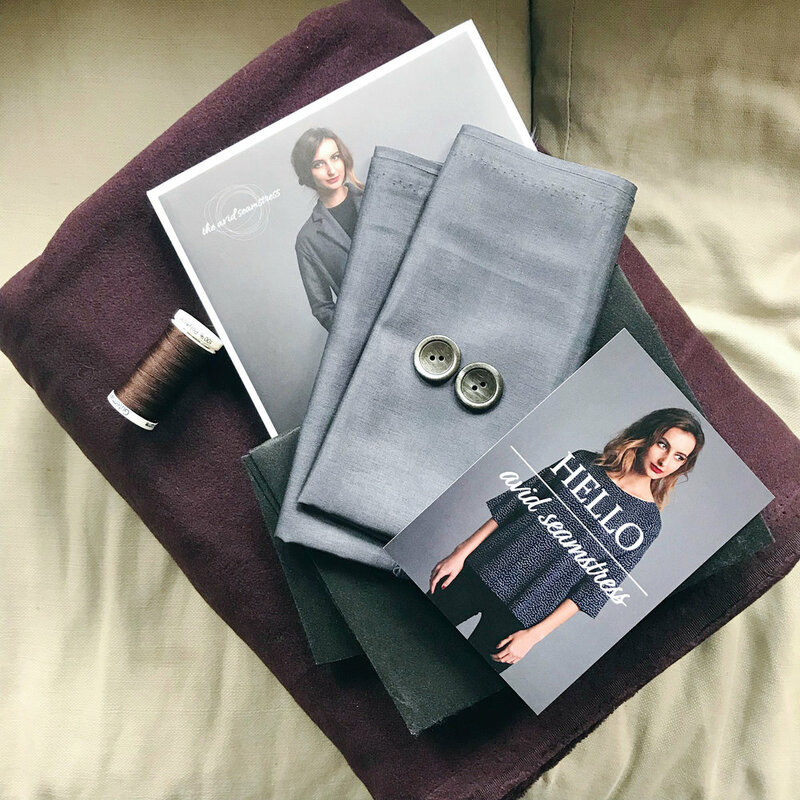 This pattern is the Unlined Raw-Edged Coat which you can buy either just as a pattern or with some delicious fabric as a kit. I was tempted by the boiled wool, but I happened to be in Mood whilst I was mulling over whether to invest in the pattern or not, and found this incredible dark green Derek Lam wool. I don't think it is boiled or felted, but is close to it and is backed by a plain black acrylicy type fabric (Mood's in-store fabric descriptions leave a lot to be desired) and I literally could not let go of it. I grabbed the bolt and hauled it around the store with me for about half an hour, heart racing due to the sheer excitement of my vision, whilst I worked up the courage to invest in the fabric and the pattern. The wool was $25 per yard. And the pattern was about the equivalent price in £. I know! I can hear the sharp intakes of breath all the way over here. By far the most expensive pattern I have bought. But my rationale is always this; if I'm 100% sold on my vision and if I know that even with the materials being on the expensive side, this is something that I would buy in a store for the same amount of money or more, and wear with abandon, then I see that as a worthwhile and legitimate investment. Particularly if my vision is such that it makes me so happy I could burst and I know that I wouldn't find something close to similar that fits me properly. Win. Win. Win. I am by no means rolling in money, but fashion and clothes and putting them together both in the sense of creating an outfit (I know 'outfit' is outdated but I hate the word 'look' in this context - it's one of those words that has been foisted on us by pseudo fashion-forward magazines), and actually sewing them together, is something that has always brought me great enjoyment. And I have prioritised that spending over others. Or to put it another way, in the past I have spent a lot of money I don't have on attire and other such accoutrements, much to my credit card and my then-boyfriend-now-husband's consternation. I've got a lot better but fashion and clothes as well as fabric and sewing make me happy (oh so superficial person that I am) so like many others, the money I do have goes on those things. As a total aside - I absolutely loved and could relate to a lot of Sanae's frank articles on the whole subject of uncontrolled spending and debt. And (and this is by no means a great revelation) if I feel like I'm not just buying what the high street tells me I should be wearing, but am representing myself as an individual and forging my own fashion path and ultimately feeling really good about my outward appearance to the world through what I'm wearing, it does wonders for how I actually feel inside and helps me conquer even the shittiest day. So, having successfully talked myself into buying both the fabric and the pattern - I mean was there really ever a chance that it wasn't going to happen? - I pretty much skipped all the way back to Brooklyn and then had to wait all of 5 days for my pattern to be delivered from the UK. And whilst £22.50 / $32 is a LOT of money to spend on a pattern; the packaging, the quality of the pattern itself as well as the stock used for the instructions etc, the little tape measure gift and the wonderful design, takes it from functional means-to-an-end to a work of art in itself. The construction was incredibly simple. There is no lining, no hems to be done and no seams to be finished. I made a few adjustments to the pattern including a whopping 1 inch forward shoulder adjustment. This left me with some confusion as to how to true the sleeve as my fitting books said I shouldn't alter the sleeve head notch, but leaving it where it was, due to such a huge adjustment, meant the under arms wouldn't align. As such I just shifted it around and I think, thanks to the loose fit and dropped shoulder this is OK. On a more fitted design probably not so much. I also graded out from a 12 at the bust / waist to a 14 at the hips and added 6 inches to the hem. The pattern suggests you can have your seams exposed on the right side or hidden away. As I'm not sure as to how much this fabric might actually fray, I decided to put my seams to the inside. I also decided not to use an iron on this. I didn't want to make the wool shiny or melt the acrylic, so I finger-pressed the seams open and then topstitched the allowance down on each side of the seam. I like how this adds a little detail to a very simple coat. My biggest dilemma was which side to use as the right side for the collar. The lapels are created by simply folding back the front edges of the jacket (and I did have to iron this bit - trepiditiously), which means they show the wrong side of the fabric and I figured that making the collar the same would look the best. I wasn't sold on the plasticy-ness of the backside but actually now it's finished I love the contrast. It was so simple to put together; even the button holes are just stitched rectangles with a hole sliced in the middle. The buttons are from Mood as well and I don't know why but remind me of the car tyre shoes worn by the Maasai, which is utterly ridiculous given my oh so western urban life, but you can't help how memories are evoked. I decided to take off a couple of the six inches I added to the pattern, so I got my rotary cutter and my metal ruler, lay the thing down on my mat, and sliced from one side seam to the other through the front and back. Hem complete in less than 30 seconds. That is my type of hem. I LOVE THIS COAT. Really truly love it. The staggering forward shoulder adjustment was 100% necessary and makes this so comfortable as I'm not constantly being strangled and pulling the thing forward. I thought it would get really sweaty due to the backing, but so far it has just proved really cosy. I adore the shape and the colour. The only downside is that because I love it so much I'm super protective of it, which means it doesn't get as much wear as it should. And it is already pilling terribly. I've made about 85 cocoon shaped things this winter - and I don't see that abating any time soon. I love this silhouette. I've also made three coats or varying degrees of complexity which is not something I ever thought I'd say. And they have all got heaps of wear. This is my favourite and it is all thanks to the lovely lady on Instagram. Thank you for the tip! ps: apologies for the shocking photos and accompanying odd facial expressions. I was desperate to blog about this but terrible weather has made these the best option.